Woodstock, the biggest-ever American music festival that was first held in Bethel Woods, NY in 1969, is an iconic event that brought together incredible musical acts that emphasized social justice and reform. Festival co-creator Michael Lang has said, “Woodstock, in its original incarnation, was really about social change and activism.” Lang wants this to be brought back to the forefront during this festival that will be “multi-generational” and will include some tribute performances to original acts like Janis Joplin, Jefferson Airplane, Joe Cocker, etc. This festival hasn’t been held since 1999, when it took place in Rome, NY due to the original grounds in Bethel Woods being unavailable, and is notorious for the scary scene marred by fires set during some of the festival’s headlining performances, which left a burning image in the minds of a nationwide television audience. The lineup was something else, though, with performing acts like the Red Hot Chili Peppers, James Brown, Alanis Morissette, Metallica, DMX, Dave Matthews Band, Rage Against the Machine, Willie Nelson, and Megadeth, among many, many other notable names. This anniversary festival will be one that has been years in the making, and will be properly planned to avoid the unfortunate negative situations that occurred in ’99. One thing’s for sure, and that’s that Woodstock will feature a lineup that will rival any in music festival history as one of the best and most eclectic mix of incredibly-talented artists that will appeal to music fans both young and old. Travis Scott sharing the stage with a Jimi Hendrix hologram? Bob Dylan jamming out with Post Malone? The possibilities are truly endless. On the same weekend, Live Nation is sponsoring the “Bethel Woods Music and Culture Festival” at the Bethel Woods Center for the Arts near the original Woodstock site. Carlos Santana, who performed at the original Woodstock concert, has already said he’s in for the three-day Live Nation event — most likely performing Aug. 17. Artists are expected to be announced in the coming weeks, but it’s those legacy acts that we’re wondering about. How many original artists could perform at the Woodstock 50th anniversary concert? An estimated 400,000 people attended the first Woodstock Music and Arts Festival, held Aug. 15-18, 1969 at Max Yasgur’s dairy farm near White Lake in the Catskill Mountains. Performers included Richie Havens, Jefferson Airplane, The Who, Joan Baez, Jimi Hendrix, Arlo Guthrie, Santana, Joe Cocker, the Grateful Dead and Crosby, Stills, Nash & Young. The iconic concert was revisited in 1994 with a modern lineup of artists like Nine Inch Nails, Sheryl Crow, Metallica, Cypress Hill and Red Hot Chili Peppers in Saugerties, N.Y., but Woodstock ’99 — held at Griffiss Air Force Base in Rome, N.Y. — ended the fun with riots, fires and allegations of sexual assault. It’s the original festival’s message of peace, love and music that still inspires fans, so we’ll focus on the original 1969 lineup. Who might return in 2019? First of all, it’s important to note that some Woodstock performers won’t be a part of the 50th anniversary celebration because they’re no longer with us. Richie Havens, Janis Joplin, Jimi Hendrix, Joe Cocker, Ravi Shankar, Paul Butterfield, Levon Helm, Keef Hartley, Bret Sommer, Tim Hardin and Johnny Winter have all died since their historic performances in 1969. The Who is still touring, with a May 9 concert scheduled in Buffalo. However, frontman Roger Daltrey has hinted it could be his last trek and recently told Billboard that he won’t be doing any Woodstock anniversary concerts. Rolling Stone reports John Fogerty hasn’t performed with surviving bandmates Doug Clifford and Stu Cook since their 1983 high school reunion, even refusing to play with them at their 1993 induction in the Rock and Roll Hall of Fame. But Fogerty still tours, and Cook and Clifford perform as Creedence Clearwater Revisited, so maybe one or the other will be included. Santana is so far the only artist — new or original — confirmed to play at a Woodstock 50th anniversary event. Carlos Santana said that he will play at the Bethel Woods Music and Culture Festival at the Bethel Woods Center for the Arts, near the original Woodstock site, and left Aug. 17 on his tour schedule open for the Live Nation event. He will not, however, play at the official “Woodstock 50” concert at Watkins Glen. David Crosby, Stephen Stills, Graham Nash and Neil Young had just recently formed CSNY when they played Woodstock in 1969, so Young sat out part of their set. A half-century later, they’re all still performing but Rolling Stone notes they haven’t performed together since 2013 and appear to have lots of tension. Still, it’s possible some of them will still perform — just not together. Jerry Garcia died in 1995, but much of The Grateful Dead have continued performing in various lineups. Rolling Stone reports “core four” members of Bob Weir, Phil Lesh, Mickey Hart and Bill Kreutzmann last performed together in 2015, but Weir, Lesh and Kreutzmann are still touring with The Dead and Company (featuring John Mayer) — and have all of August free on their calendar. The folk singer is on a farewell tour with concerts booked through July — Woodstock 50 would be a heck of a place to make a final bow. Garth Hudson and Robbie Robertson are the only members of The Band still alive today, but don’t expect them to perform — though Lang said there would be “tributes” to the Rock and Roll Hall of Fame group that featured the late, great Levon Helm. Original members Larry “The Mole” Taylor and drummer Adolfo de la Parra still perform as Canned Heat, so maybe. Sly Stone is pretty much retired, but The Family Stone still tours with a lineup that includes original saxophonist Jerry “Papa J” Martini and Sly’s daughter Phunne Stone (a.k.a. Raw Syl). The group put on an impressive show at the New York State Fair in 2017. Woodstock-era frontman David Clayton-Thomas still performs as a solo artist, but the touring lineup of “Blood, Sweat & Tears” doesn’t include any original members. Not likely. Rolling Stone reports the “Mississippi Queen” rockers haven’t performed together since 2010, and frontman Leslie West is the only member still performing who was actually at Woodstock. Grace Slick is retired, and some members have died, but there are still a couple original Jefferson Airplane members performing with the band Hot Tuna. “Jefferson Starship” and “Starship Featuring Mickey Thomas” also still tour, but none of their members were at the original Woodstock. The 71-year-old folk singer is currently on the “Alice’s Restaurant Tour,” with concerts scheduled through June — leaving room for Woodstock? According to Rolling Stone, only two of the 12 members at Woodstock are still performing with Sha Na Na today: Drummer Jocko Marcellino and singer Donald “Donny” York. Could they be included? Maybe. The group reunited for Woodstock ’94 with three original members, but the ’60s band has been dormant since. Other original Woodstock performers included Melanie, Country Joe McDonald, John Sebastian, Ten Years After, The Incredible String Band and Quill. 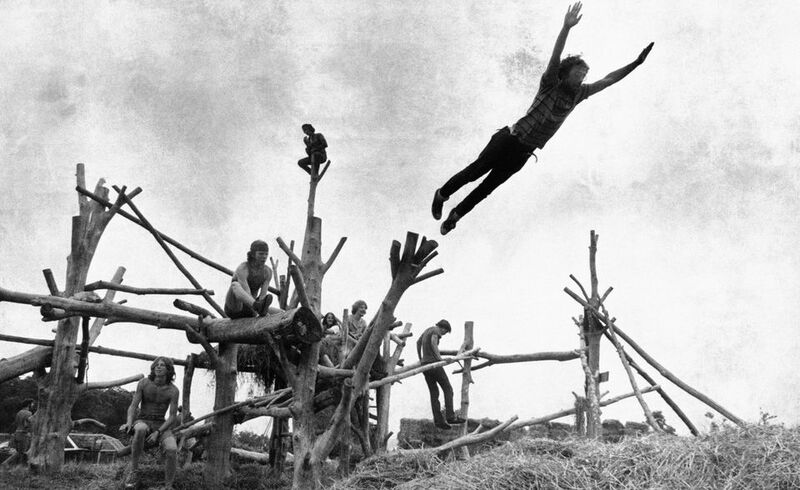 Rock music fans sit on a tree sculpture as one leaps mid-air onto a pile of hay during the Woodstock Music and Art Festival held on a cow pasture at White Lake in Bethel, New York on Aug. 15, 1969. Can Woodstock 2019 save the festival’s legacy? Lang told Rolling Stone he learned from Woodstock ’99, including issues with high water prices and questionable acts on the lineup. He called it an “MTV event” and promised Woodstock 50 will be different. 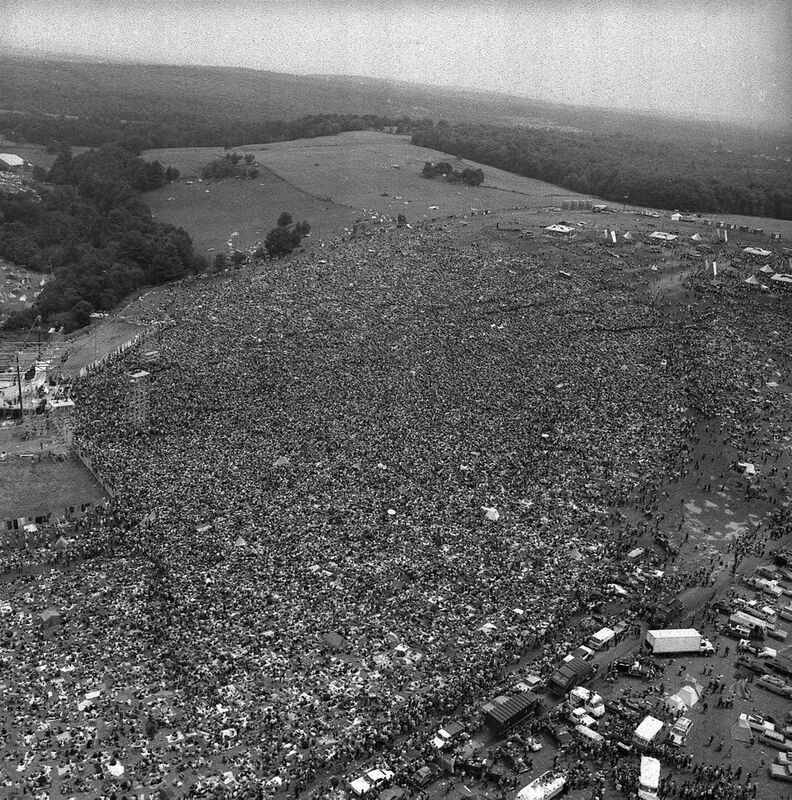 In this Aug. 16, 1969 file photo, more than 400,000 people attend the Woodstock Music and Arts Festival in Bethel, N.Y.